We went off script this past Sunday and had churros for breakfast! Real fried churros because I've been feeling this urge to fry something. Maybe this cold, messy weather is doing weird things to my brain. Whatever the motivator, I got to make something I've wanted to for a long time (that list of things is so long, by the way). It was fun and a delicious treat. Do you know what I think about when I think of churros? The subway. Yes, I think of the New York subway system because in the days when I was going to college and working in NYC, I'd be hopping around on the subway and I remember seeing a lady selling churros on one of the number train platforms. I'm not sure if it was the same lady each time but she'd be carrying a tray with these long sticks of fried churros, calling out: "Churros...Churros..." The tray was covered with a large dish towel (to give it some protection from the inevitable whirl of dust that comes with the territory) and while I was somewhat enchanted by her and her offering, the reality of buying food from the train platform brought me back to reality and I refrained from ever being a customer. Maybe if she sold them with a side of chocolate dipping sauce, it would've been different. Churros are one of my "fantasy foods", a food that I feel familiar with but, in reality, have rarely eaten. The last time we had a churro was at SeaWorld over a year ago...and sadly, it was not very good. I vowed to make it at home one day so I can finally claim some familiarity with this food item whose name I love to chant. And I longed to take advantage of eating some fresh, warm from the fryer. So it was a struggle to take these pictures and capture my first churro-making moments because I was bent on enjoying these fresh and warm with my family. I managed well enough. And we dined on a breakfast of freshly fried churros rolled in vanilla-sugar, with some chocolate sauce on the side. We all had a bit of a sugar high that morning but what a fun and delicious treat! As you probably know, the dough for the churro is similar to pate a choux in that you mix the dough together over the stove-top. In researching recipes for this inaugural churro endeavor of mine, I realized that churros can contain eggs or not. In the end, I settled on Rick Bayless' recipe. I figured it was a safe bet since Rick Bayless is a very well-respected source for Mexican cuisine. Secondly, his no-egg recipe is super easy, as you'll see from the instructions to follow. I think I was very lucky to land on this recipe. The dough was quick and easy to mix up, as well as easy to handle and fry. The churros turned out super crunchy, which is most satisfying since that's ultimately what you're after when frying! Instead of the more traditional coating of cinnamon-sugar, I decided to coat my churros in vanilla-sugar. It's delicious and you really taste those fresh vanilla beans. And without a doubt, I looked forward to dunking our churros in some chocolate sauce. I made a water ganache, a chocolate ganache made with water instead of cream. I love ganache and I've been thinking about using/substituting with a water version more often. This has as much to do with convenience as anything because I don't often have cream in the house. And it might be silly to talk about saving some calories and fat grams when I'm frying up churros for breakfast, but making a sauce or ganache by just melting chocolate with water makes sense because you actually get a deeper chocolate flavor so you're not sacrificing taste. A water ganache might not look as creamy as one made with cream, or one that has butter added to it, but is still smooth and tastes great! In the face of frying, which I don't do very often, I wanted to be prepared. I put myself in a good starting position with this recipe. It's very simple. You bring a cup of water, 2 tablespoons oil, a tablespoon of sugar, and 1/2 teaspoon of salt to a full boil. Take it off the heat and add a cup of flour to the pan all at once. Immediately stir everything together vigorously until the flour is absorbed and you have a smooth ball of dough. And you have your churro dough! Let it cool to room temperature (you can prepare this dough a few hours in advance and leave it covered at room temp). Now, for piping. I wanted to make things easier for myself and, for me, I thought piping the dough out in advance onto a piece of parchment paper would work better for me than to drop it straight into the fryer. I settled on using the Wilton 1M star tip and I'm very happy I did. It gave the churros very distinct ridges that increase the crunchiness after frying. For this special occasion, I brought out and used a canvas piping bag - something I've had in my baking tin for years and years but never used before. Since the dough is very firm and stiff, a heavy-duty canvas or disposable piping bag is best. You can pipe the churros onto the parchment paper. No need to flour the paper. I found the dough easy to pick up and move around. I also tried piping this dough straight into the oil and it was actually not as difficult as I imagined. The dough - maybe because there are no eggs - did not curl much at all in the hot oil. I'd read that to get a straight churro, you need to pipe and freeze the dough first. I wasn't too keen on the idea of freezing the dough and I'm glad to know it wasn't necessary. I made my churros about 4" in length and piped a few 1" mini's for fun. In the interest of safety, I kept my camera away from the frying pan. I fried the dough in 375 degree oil and they take about 2-3 minutes per side and should be ready when golden. I used a thermometer but you can always make one first as a tester. Fry until golden and when you open it up, it should be crisp and done inside. I cooked 3-4 at a time in a small enamel cast iron pan. To serve these warm all at once, you can place them in a 300 degree oven until everything is ready. Once fried, I drain the churros for just a minute on paper towels and then rolled them in vanilla-sugar while they were still warm. I actually remembered to use my jar of vanilla sugar but also amped it up by adding the seeds of 1/3 of a vanilla pod to 1/2 cup of the sugar. For the chocolate dipping or dunking sauce, I melted 60% dark chocolate and water over a pan of barely simmering water. When it comes to ratios, I've seen different ones for water ganaches and it depends on the thickness you're after. In this case, I wound up using an equal amount. The ganache thickened up pretty quickly and I was looking for a relatively thin sauce for dipping. I started with a bit less water but added more in the end to about an equal ratio of each. Keep the sauce on the side over warm water so you can warm it back up and stir it together, if necessary, right before serving. This was a fun project! I really enjoyed making myself better acquainted with churros. And there is just so much satisfaction from doing something you've wanted to do and learning things along the way. It's all the better that this hobby of playing with food often leads to something delicious to eat like it did in this case. Besides making churros this past weekend, I also tried the one-pot pasta method for the first time. Both were eye-opening in its own way. The weekends seem to revolve around food and what to cook and eat during these long, cold winter days. Since we had yet more snow last Sunday (...and continue to because it just doesn't seem to want to stop...), I was glad that we had plenty of hearty food in our bellies. That said, I'm ready for Spring, even if it means giving up churros! 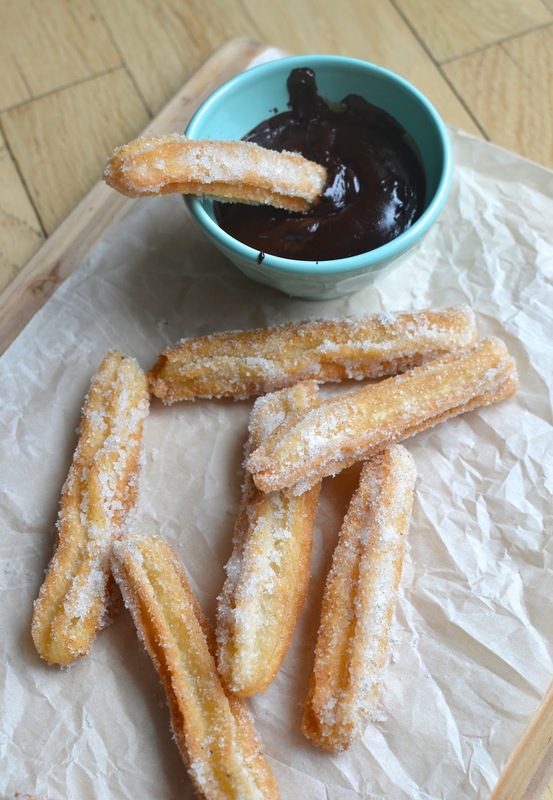 Have you ever made churros? If so, did you use an egg or no-egg recipe? March 11, 2014: My son's Spanish class has been learning about food lately. He told me that they had to come up with a dessert idea today (how fun is that!). He and his partner decided on churros - with ice cream, chocolate sauce, and sprinkles. Hearing that, I cannot stop asking myself why I didn't have some churros with ice cream and chocolate sauce! Another update (April 2015): We recently took a trip to Chicago and had the pleasure of trying the "real deal" at Rick Bayless' eatery, XOCO! The churros were wonderful, certainly better than the ones I attempted at home! Fresh and warm from the fryer, the churros were crisp on the outside and soft in the center (it's that softer center I really enjoyed). The chocolate sauce was fruity and full of deep, dark chocolate flavor. I've learned that there is no shortage of amazing eats in Chicago, and getting a chance to try Rick Bayless' food was a major highlight. I had no idea the man was such an amazing chef; the flavors of his food was so unique and quite simply, delicious. Make dough: Place the oil, sugar, salt, and cup of water into a medium-small (about 2-quart) saucepan. Bring to a boil over high-heat, stirring occasionally. Remove pan from the heat, add all the flour into the pan at once, and stir vigorously until mixture turns into a smooth, thick ball. Let cool to room temperature in the pan. Fit a pastry bag (since this is a stiff dough, a heavy-duty pastry bag like a canvas one would work best) with a large star tip (I used Wilton 1M) and set aside. Prepare vanilla-sugar and chocolate sauce: For vanilla-sugar, place 1/2 cup sugar into a wide shallow bowl. Cut open the vanilla bean pod lengthwise and scrape out the seeds into the sugar. Stir seeds into the sugar with a fork to combine. Set aside. For the chocolate sauce, place chocolate and water into a bowl set on top of a pan of barely simmering water. Stir until chocolate is melted and mixture is smooth. Set pan nearby to warm up again right before serving, if necessary. Fry the churros: Heat about 3 inches of oil in a cast-iron or a heavy-duty, high-sided pan over medium to medium-high heat to about 375 degrees. Transfer dough into the prepared pastry bag. You can pipe churros directly into the oil by holding the pastry bag a few inches above the hot oil, piping out about 4 inches of dough and detaching it from the pastry tip by cutting it off with a knife, scissors, or using your fingertips. (Alternatively, you can pre-pipe the dough onto a parchment lined baking sheet like I did.) Fry a few churros at a time - so as not to overcrowd the pan - about 2 to 3 minutes per side until golden. Remove the churros from the oil, let drain on paper towels for about a minute. Then roll warm churros into the vanilla-sugar to coat. What can I say...I love breakfast! : ) Homemade does tend to beat store bought...and theme park eats are probably just particularly easy to beat. Churros for breakfast...wow..that's decadent. But hey...why not? Life is too short. They look great! 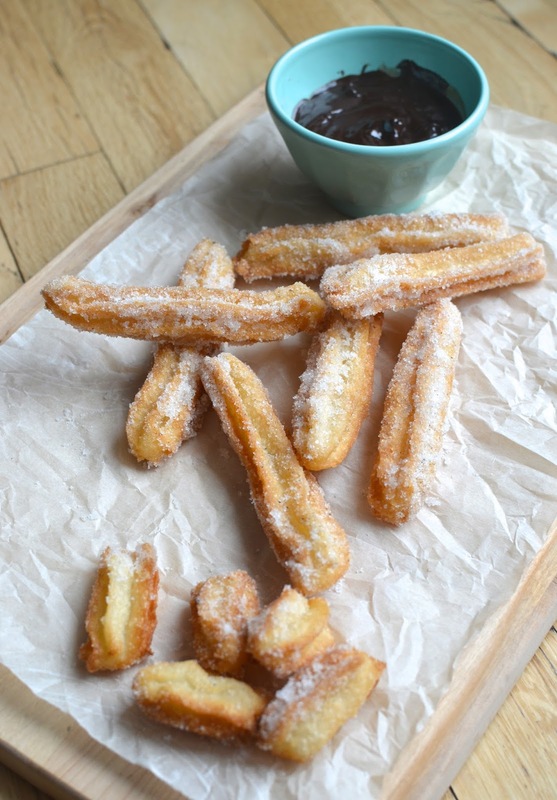 Churros for breakfast sounds like the best treat ever!! I've always wanted to try making them too and yours look perfect! What a fun Sunday it must have been making these :) Definitely looking forward to spring though! Thanks - I had so much fun doing something a little different and learning not to be afraid of frying. Oh, how I missed churros. Growing up in the Philippines (with its strong Spanish influence), churros is the hallmark of great breakfasts! Dipped in deep, luxurious melty chocolate, and I am in heaven! Hallelujah! Amen! Love this! That's all! I love churros. I've been on a hunt for a good recipe. I will be trying this one out. My question is, the churros I find in some places are a little bit crunch and hard in texture, but when made with pate a choux mixture, it turns out to be on the softer side. So, is yours a little bit on the harder side, because you didn't use eggs? Yours looks amazing though, I will be coming down for breakfast whenever I visit you.:). Great question and I thought about it, too. These churros were definitely very crunchy and I have to think that the ones made with eggs would be more tender, softer inside, and with a bit more richness than this one w/o. The inside of these aren't totally hard but it is firm. After making and tasting it, knowing I didn't lack for crunch, I made sure to take the churros out while golden, not dark, so they don't get *too* crunchy. Hope that makes sense. What a super special Sunday breakfast. I've never made these and never tried them. I was looking at them recently (only because we have this mind-meld thing going on so since you were thinking about them I was thinking about them) but mostly because of the chocolate dipping sauce I was thinking about using for another idea. You nailed it - these look perfect. Love the vanilla sugar and I had no idea you could make ganache with water - how smart! It's snowing today - I think we have about 8 inches so far. I hope it get's warm soon! Have a wonderful weekend and happy baking! I have made ganache with water for that chocolate hazelnut meringue torte...oftentimes, recipes using water add butter. It works nicely...it looks a bit less smooth as it cools but I love the taste...full on chocolate! Ooh ... I love churros! And how fun to make them at home. They look wonderful. It was fun, Beth! It felt like a theme breakfast and I think my little guy got a kick out of having something we've been talking about. Just what im in a mood for. I have a cup of tea ready, and now I just need these to go with it! It is nice to have one or two with something hot to drink...particularly when it's freezing out! Thank you. I love churros, but do not like frying, so I use the waffle maker...I love how pretty your churros are...and the vanilla sugar sounds delicious! Oh, Juliana...that sounds delicious! I just need a waffle maker (that's another reason for me to get one!). Like you, I don't fry often or particularly want to but I had this urge to. You know I had thought of trying a baked recipe but in the end, I wanted to "real" thing. Have a great weekend ahead! I love, love, love churros Monica! It would never occur to me to have them for breakfast, but you just changed my mind! I want some right now, and these would be perfect. Pinned! Thanks so much - glad you like it. Monica, these look wonderful! I love churros and have made them...but only once. Can't remember which dough I used though but I'm definitely going to try yours! I think these will make a wonderful sample at the showroom one Saturday. It's funny about how you are craving frying...so am I for some reason! I'll find something to fry!! It's definitely not something I see myself making at home often (I don't fry that often) but what a treat and it's so good to shake it up for a change. : ) So funny we are both thinking about frying! Gotta be something in the air. Hope you make these - they are quite crunchy without eggs in the batter, which is great but do take them out when they're golden, not too dark, so they're not *too* crunchy or hard. Yes, Ashley! If I didn't have the chocolate sauce, I'd try a traditional cup of hot chocolate with the churros. Now that's a good tradition! : ) Coffee is good too though. Your churros look perfect! I tried making them once and it was a disaster. They had the strangest texture and kind of burst open some along the sides I think I used a recipe with eggs and if I remember correctly I added some pumpkin. I have actually only tried churros last year! This looks so good! These look SO good! I love churros but have never tried making them myself. Must try one day! Hi Amanda - thanks! It was a fun little project. I know all about these food cravings...one pops up every week! That is one of the drawbacks of blogging - juggling the desire to capture what you made neatly and wanting to forget all that and just dive in. That's why I often can't wait to make a recipe I posted about again. Thanks so much, Lorraine! I've always wanted to try making them at home - these look fantastic! And super crispy ... and with that vanilla sugar ... gah you're making me hungry! Hey Ashley - that's too bad about the restaurant because realistically, something like churros is best reserved for occasional enjoyment outside the house! : ) It is fun to make something like this at home though...I talked up the fact that we'd be having churros for breakfast for days beforehand! : ) These are really crispy and you can taste that vanilla. I know you're all about the vanilla so you can just skip the chocolate sauce and have them plain with a cup of tea! P.S. - I took the crinkled parchment paper idea from you! Hope you don't mind. haha! I am so un-creative that I have to borrow ideas. It is a good plan, Betty! Thanks so much. Hi Monica, have not had a churro in ages, love that you had them for breakfast, how special! It did feel like quite the fun treat. Thanks, Cheri. Amazing. I'd love some for breakfast (and snacks) any day of the year. I ate a lot of churros in my childhood, and when I moved to America I definitely miss them. These look delicious! *oohhhhhhh* i am in AWE! those look amazing...churros are one of my favorite treats, and i've never, ever made them at home! My goodness, they are just gorgeous. Maybe the weather is doing weird things to me too but i'd happily eat ALL of these. Thanks! I've wanted to make them for ages and this recipe turned out quite well. It was a fun and tasty breakfast for sure. This is one of those things so good fresh (I suppose most things work that way!). : ) This was a really fun project. I was kind of nervous about it and thought about it a lot beforehand but it worked and was so much fun to make and eat with my family. Hope you have a little churro party one day! Deep fried foods, done right, are irresistible! I bet your Indian sweets are pretty irresistible! As you said, churros are one of those fantasy foods. You get them in the dream land (theme parks). Sugary and warm! And hooray to the idea of serving these for breakfast! Fried dough and chocolate.... YUM! Definitely will try this soon! Hi again, Jo! Is it me or is making something like churros something you have to think about and mull over well in advance?! I feel like this batch of churros was in the making for so long. That dulce de leche sauce sounds perfect for churros! Yum! Please make them soon and post it on your blog so I can see (or email me a pic! haha). I know all about procrastination...it just is the way with certain things/food!